NEW: Beta-release of our interactive density maps! Patience Grasshopper…sometimes these maps take a few seconds to load. Here are some initial views of our density maps that can be explored interactively. We’re working on the display-settings, and we’re very happy to have feedback. Tell us what you think (be nice please 🙂 ). Please read the details below. These predictions are most accurate at the broad scale (city-wide), but they still provide interesting approximate estimates when you zoom in to a particular neighbourhood. Have fun! A huge Thank-You goes out to Genevieve Perkins: she’s the volunteer who has been building these interactive versions of our density maps. Thanks Gen! These maps show the predicted density of bird species across Ottawa (birds/ hectare). You can overlay multiple species (although it gets more difficult to see details), or flip through each species in turn. Click the check-box beside each species’ name to turn the species density on or off. How many birds nest in Ottawa? 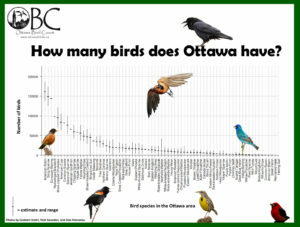 The points for each species on this graph represent our best estimate of the population size for each of the 73 most common bird species in the city of Ottawa. More detail on the estimates (and the estimates themselves) can be found below. This excel spreadsheet lists the estimated population sizes for the 73 most common bird species in our study area. There are about 1.8 million nesting birds sharing “our” city. These estimates are derived from a statistical model that relates the bird observations from our point count program to a habitat/landcover map of the study area, (while controlling for different observers, traffic noise, the time of day, and the day of the season). Using the relationships between the bird observations and the habitat at our point count locations, we can then estimate the total number of birds in the entire study area. The upper and lower limits to the estimates represent the outer bounds on the estimates (one reasonable interpretation is to think of the true population being somewhere between the upper and lower limit, and the estimated population size is our best estimate). This presentation summarizes some of the results so far: occurrence of specific bird species, population estimates and the projected densities of certain birds. We’ve created maps of the predicted density of the city’s more common bird species. We’re also working on a new interactive way to explore these maps, so stay-tuned. If you’re statistically skilled, you might want to explore our point count database. You can download the full database in this .csv file OBC_Full_PointCount_database_16_Mar_2019 (which you can view using excel or any other spreadsheet reader). We’d love to hear what you discover or what you do with it.